IWF -If not ObamaCare, then what? Single-payer? The Affordable Care Act has issues, and Republicans continue to push alternatives that not every voter supports – which begs the question: Would America be better off with a single-payer healthcare system? A single-payer healthcare system is one in which the government pays for all healthcare expenses. Some people and organizations have been in favor of such a system, even before the Affordable Care Act (a.k.a. ObamaCare) was a bill before Congress. 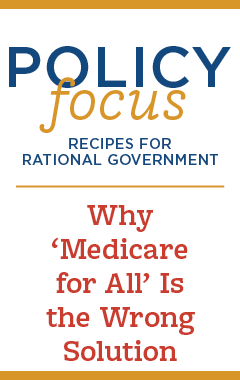 Meanwhile, some organizations don't go so far as to call for a single-payer system. For example, the group Physicians for a National Health Program (PNHP) says something in the way of a national health insurance program could save billions on paperwork alone. PNHP adds that doctors would also remain in private practice, as opposed to being employees of the government. Whatever the case may be, Hadley Heath Manning, director of health policy at the Independent Women's Forum, reiterates that nothing is free. "Government-run healthcare is still paid for through tax revenues," she emphasizes, "and given the political challenges to raising taxes – even associated with a healthcare program – the government has two options: they can continue to raise taxes to fund some kind of single-payer healthcare program, or they can try to contain costs." Manning says the only way government can contain costs is essentially through rationing healthcare services. So either way, she says, the individual patient loses. "... Because either we're going to continually pay higher and higher taxes in order to support a system like that," she explains, "or we're going to see the reimbursements and the payments that the government makes to healthcare providers decreased, capped, [and/or] limited. And this, of course, causes the quality of those things and the availability of those things to deteriorate for people who really need access to care." According to information this month from Gallup, more Americans are saying their health premiums went up over the past year. In November, Gallup announced findings that ratings of U.S. healthcare quality was no better after the Affordable Care Act. Also in November was a Gallup poll showing Americans became more negative toward the ACA.